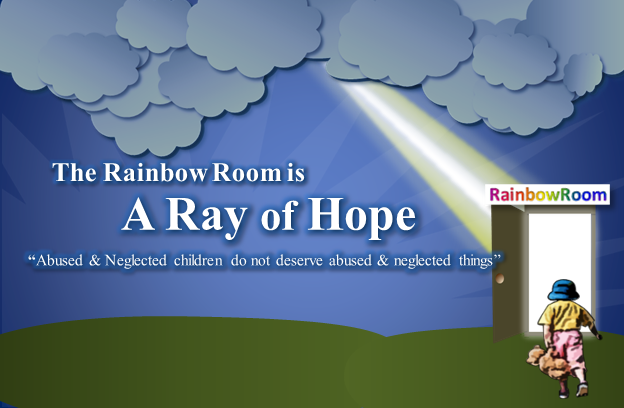 The Rainbow Room of McAllen is a Ray of Hope. You can be a ray of hope to these children. A call is made to Child Protective Services caseworker Mary Smith at midnight. She is asked to check into a report on three children ages 2, 5, and 7. Their mother had left them with a baby-sitter three days earlier while she was looking for work in another city. The baby-sitter stayed only one night and left the next morning. The children have been home alone since. Mary discovers the home contains rotting garbage and is infested with bugs. There is no food and Mary finally gives up her search for a dry diaper for the 2 year old. Mary realizes that in order to protect the children she must remove them from their home. She gathers the children’s meager belongings in the only container she can find–a black plastic garbage bag–and drives away with the three frightened children in her car. Luckily for Mary there is a source of immediate help. Her town recently opened a Rainbow Room, an emergency resource room that stocks items such as diapers, formula, car seats, clothing, lice shampoo and other necessities for caseworkers who find themselves in Mary’s situation. Just one year ago, this wasn’t the case. Mary would have searched for an all-night convenience store and bought the necessary items with her own money. The most basic needs of a family in crisis are often unavailable, and caseworkers typically cannot provide the necessities from their personal resources. With the introduction of the Rainbow Room, assistance with basic needs becomes available. This helps keep families together through traumatic times and can be equally critical in developing a helping relationship between caseworkers and the families they serve. Rainbow RGV Community Partners is 501 c3 non profit organization operated by volunteers whose mission is to form a partnership between Child Protective Services and the community. Rainbow RGV Community Partners believes that through these joint efforts a caseworker is better able to protect and assist families and children in crisis.